The Shuwa Arabs are commonly referred to as the "Baggara." This name is derived from the Arabic word bagar, meaning "cow," and refers to the Arab tribes in West Africa who are cattle herders. 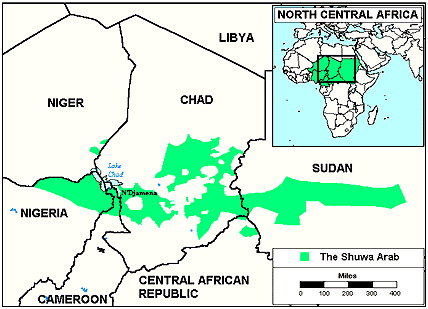 They are spread from the Lake Chad region eastward to the Nile River in the countries of Sudan, Niger, Chad, Cameroon, Nigeria, and the Central African Republic. They live in a hot, semi-arid climate with zones ranging from sparse shrub lands to wooded grasslands. The Baggara tribes are of Arab descent and mainly speak the Shuwa dialect of the Arabic language. They entered western Sudan between the twelfth and thirteenth centuries, and have gradually moved east and west from there. By the eighteenth century, they were concentrated primarily to the north and east of Lake Chad. Their tribes continued moving eastward until they became widely scattered across the horizontal plains of West Africa. They have intermarried with the tribes who lived close to them. This mixture of blood has given the Baggara darker skin and thicker lips than other Arabs. Unlike their Arab neighbors farther north, the Baggara are unable to raise camels because of the thicker vegetation and more humid climate. Most of the Baggara tribes are nomadic. Each year, the herds are moved south to the river lands during the dry season, and north to the grasslands during the rainy season. Before changing locations, the Baggara usually plant sorghum, sesame, millet, and beans in their fields, harvesting the crops on their return. The roles of the Baggara men and women are very distinct. The women are responsible for milking the cows. They sell the raw milk to factories, and processed milk either at the marketplace or door to door. They keep the earnings for themselves, or use it to pay household expenses. The women also build the houses, tend to the children, go for water, prepare the daily meals, and trade in the marketplace. The men are primarily involved with caring for the herds. They also plant and harvest the crops. Although the mother is the primary caretaker of the children, the father may also show them some affection, or discipline them from time to time. Since the women are capable of adequately maintaining the household, the men will sometimes leave for one or two years at a time to work in other countries. 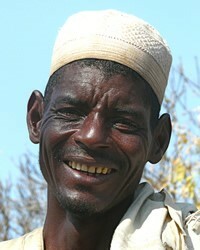 The Baggara depend entirely on their animals for survival. The people feed on milk and cheese during the winter. Animal fat and dung are used as healing ointments. The skins are used to make clothing and tents. Even the bones are used to make ornaments and weapons. A Baggara's life revolves around his animals and he is strongly devoted to them. The Baggara live in simple dome-shaped tents built by the women. They are portable structures that can easily be packed and moved along with the herds. When preparing to set up a new camp, the bed for the woman and small children is built first, then the tent is put up around it. The tents are built by placing saplings into holes in the ground, then bending them over and tying them at the top. Smaller branches are tied into the frame, and then covered with thatch or grass mats. The tents are arranged in a circle, and the cattle are brought inside the circle at night. Married women own the tents and their housekeeping contents. The men build a "sun shelter" either inside or just outside of the camp. They gather there to eat, talk, nap, or entertain their friends. Although most Baggara tribes are nomadic, there are a few that live in farming communities or towns. Their houses are built of mud bricks and have thatched roofs. Corrals for the young animals are built inside the compounds. Baggara marriages are often polygamous. If a man has two wives, one of them may live in a pastoral camp, while the other lives in a farming village. Products and labor are exchanged between the two households, adding to the family's income and making it more flexible. The Baggara have been Muslims since the thirteenth century. They wear the clothes prescribed by the Muslim religion, and bury their dead facing Mecca, the "holy city" of Islam. The Baggara believe strongly in evil spirits. Each morning, a man sneezes in order to rid his nostrils of the evil spirit who slept there the night before. Some of the Baggara tribes have been ministered to by missions agencies. Because the people are so devoted to the Islamic faith, very few of them have converted to follow Jesus. Also, the nomadic lifestyle of the Baggara makes it very difficult for missionaries to reach them. Concentrated prayer and evangelism efforts are necessary in order to reach the hearts of the Baggara with the Gospel. * Ask God to encourage and protect the small number of Muslims who have become Christian believers. * Pray that Christians living in West Africa will be stirred with vision for outreach and a genuine burden to reach out to the Baggara tribes. * Ask the Lord to raise up strong local fellowships of believers among the Baggara.View Baggara, Shuwa Arab in all countries.